You'd do anything for your dog. It keeps you company and does the cutest things which you can Instagram and post to Twitter. All it asks in return is a few walks and treat every now and then. Your dog does not need a social network for its dog park parties, but obsessed dog owners are going to love it anyway. 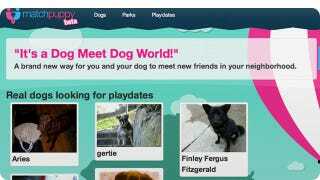 MatchPuppy is a new combination social network and dating site for your dog, which is currently in beta. It's pretty straightforward: You go to the website, sign up, and enter a few details about each of your dogs. After telling the site about your dog's energy level and why you love it, the site asks you what your dog's favorite parks are, and then offers you one of several" playdates" that have been set up at them. The site is currently only available in New York, but knowing people and their dogs this could catch on and blow up.